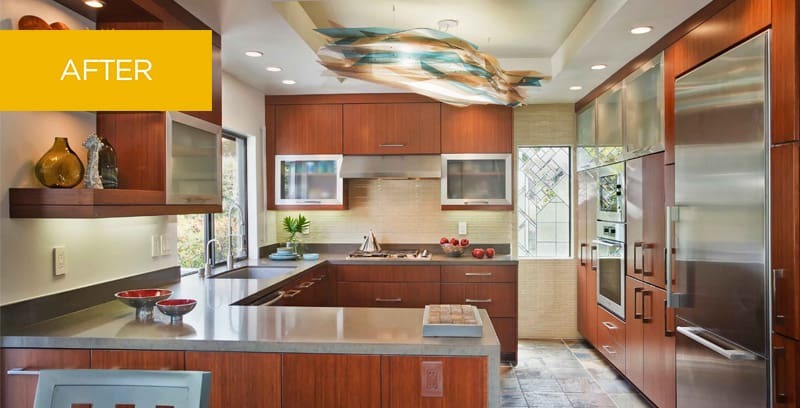 A retired couple with grandchildren and a shared love for art, our clients live in an architect-designed home that had one missing element – a kitchen to express their personal style and suit their needs today. 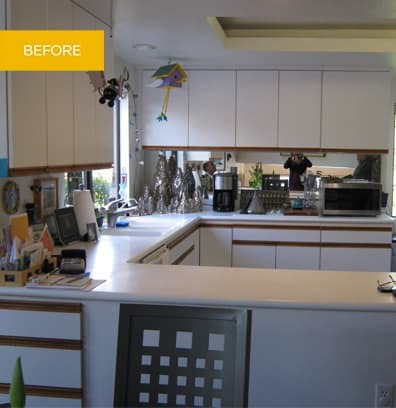 While improved function was certainly desirable, especially the ability to easily clean and maintain the kitchen, the aesthetics of the room were more important to our clients. They wanted a kitchen full of light and life. Throughout the rest of the home, white walls act as a canvas for the couple’s lifelong collection of art. In the kitchen, we encouraged the use of color and introduced materials and textures with layers of visual appeal. The space was designed with careful attention to balance and symmetry. Appliances are rigorously flush with the cabinetry, contributing to the feeling of a clean and open space. An organically shaped custom-designed light fixture makes a dramatic statement in the center of the room, setting the stage for the artwork displayed throughout the kitchen.